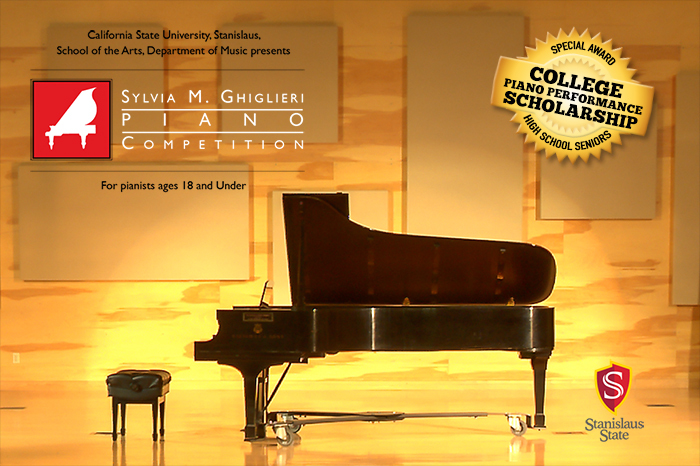 The Sylvia M. Ghiglieri Piano Competition recognizes and promotes the musical achievements and development of promising young pianists. Winners will be chosen based on performances held at California State University, Stanislaus, in Turlock, CA on Saturday, October 27, 2018. Events of the competition take place in Snider Recital Hall and the Music Building, located on the west side of the University campus. All winners perform in the Winners Recital immediately following the competition. Awards include consideration for a college scholarship of up to $2,500 (renewable annually over four years of collegiate study for a potential total of $10,000) to high school seniors placing in 1st, 2nd, and 3rd Prizes of the Senior Division, along with nearly $1,000 total scholarship awards for competition winners to attend the Stanislaus State Summer Music Camp. Summer Music at Stanislaus offers distinct artistic instruction in solo piano and chamber music performance for pre-college pianists who will be taught by faculty and associates of the Stanislaus State Department of Music. The camp also offers instruction in choir, band, jazz band, orchestra, and a variety of elective music classes. The competition schedule will be posted here near the competition date. Check back. Here they are: 2018 Award Winners! All Award Winners - All award winners are given the opportunity to perform in the end-of-competition Winners Recital in Snider Recital Hall. About the college scholarship award: The college piano scholarship consideration entails up to $2,500 of award funds renewable annually for a total of up to $10,000 dispensed over four years of collegiate study at Stanislaus State. Scholarship funds are received upon actual admission and enrollment at Stanislaus State. Any senior high school winner who would like to qualify for this special award must notify Dr. Sarah Chan of intent to apply for and enroll at Stanislaus State as soon as that decision is known. Applications will be processed on a first-come, first-served basis with a maximum number of applications accepted and observed in each division. Registration is be exclusively online. Previous First Prize Winners are not eligible to enter the same division in subsequent years, with the exception of pianists in their senior year of high school who wish to compete in the Senior Division for college piano scholarship consideration and who intend to apply for college piano major studies at CSU Stanislaus. Two pieces from contrasting style periods (eras). Time limit: 10 minutes. Two pieces from contrasting style periods (eras). Time limit: 14 minutes. All pieces must be performed from memory. Competitors must provide original scores for the adjudicators at the time of their performance (no photocopies). Baroque Era: A movement of a French suite, English suite, or Partita by Bach. An invention, sinfonia, prelude and/or fugue from Bach’s Well-Tempered Clavier. A sonata by Scarlatti. Classical Era: A movement from a sonata by Haydn, Mozart, or Beethoven. Romantic Era: An impromptu, nocturne, intermezzo, prelude, mazurka, etude, polonaise, scherzo, ballade, sonata movement, or other work by Schubert, Mendelssohn, Schumann, Chopin, Brahms, Liszt, Rachmaninoff, Grieg. Contemporary Era: A movement or work by Debussy, Ravel, Bartok, Prokofiev, Shostakovich, Kabalevsky, Poulenc, Schoenberg, Gershwin. All winners receive scholarship awards to attend either the Junior Piano Camp (grades 6-8) or Senior Piano Camp (grades 9-12) of Summer Music at Stanislaus in the year they win. Awards applied upon actual enrollment. Winners planning on attending the University summer music camp must declare their intent by registering for camp no later than April 15, along with an email to Dr. Sarah Chan declaring such intent. Summer Music at Stanislaus is held in June; registration and information may be accessed at Summer Music page. Additionally, all winners in the Senior Division who are seniors in high school will be automatically considered by the jury for a college scholarship award of up to $2,500/year (up to $10,000 over four years) to attend Stanislaus State as a piano performance major. The college scholarship is awarded at time of actual University enrollment. Qualifying seniors who wish to accept this award must apply to the University within the October-November application period that runs concurrently with the competition event. They must also notify Dr. Sarah Chan at schan7@csustan.edu of their intent to apply and enroll in the University as a piano performance major for the following year, at which point their competition performance will be considered their entrance-scholarship audition in lieu of one to be taken through the Music Department auditions in the Spring. Adjudicators may elect not to award a prize in any given category should there be no qualified competitor to receive it. All decisions made by the adjudicators shall be final. The competition is held at California State University, Stanislaus, One University Circle, Turlock, CA 95382, USA. Competition events, along with the Winner’s Recital immediately following, will be held in the Bernell and Flora Snider Recital Hall (M-6A), ocated on the northwestern side of the Stanislaus State University campus. Parking Lot 3 will provide the easiest access to this area. Additional questions may be directed to Dr. Sarah Chan, Director of the Sylvia M. Ghiglieri Piano Competition, at (209) 667-3429 or schan7@csustan.edu. Registration is exclusively online. Deadline is October 17. Please use the link below and select the proper division for registration. A Release of Liability and Photography Release is required for each participant and must be signed before participation. The Release of Liability and Photography Release can be down loaded and brought to the competition.